When I was just a budding safety professional (back in 1997) a nomenclature war was raging in the safety industry. A war of words that promised to change the world economy as it relates to safety and worker’s compensation. That war Incident (the righteous) vs. Accident (the evil empire) took all of us down a path no one wanted to go. And if you were the betting type, you most likely lost everything you owned because you got sucked into this little scuffle, and well, picked the wrong side. I almost signed on too, but then…I was too young to fight. And today, I got thinking – whatever happened to this debate? Safety professionals tend to be myopic in their pursuits (I too was once) of saving the world and often times a little pollyannaish. The world of safety thought that by enacting a euphemism they could somehow reduce accidents from occurring at all. 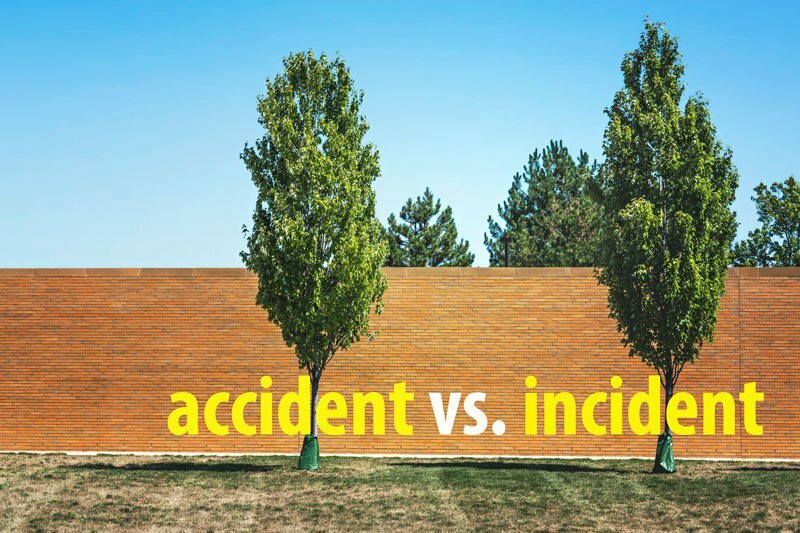 Sure, the word incident is more benign than accident. And certainly the power of positive thinking has changed many peoples lives. But changing a word, doesn’t make the fundamental issue go away. If it did, then our country would probably be able to solve many more serious issues. Incident: An unplanned, undesired event that hinders completion of a task and may cause injury, illness, or property damage or some combination of all three in varying degrees from minor to catastrophic. Unplanned and undesired do not mean unable to prevent. Unplanned and undesired also do not mean unable to prepare for. Crisis planning is how we prepare for serious incidents that occur that require response for mitigation. Accident: Definition is often similar to incident, but supports the mindset that it could not have been prevented. An accident is the opposite of the fundamental intentions of a safety program, which is to find hazards, fix hazard, and prevent incidents. When we accept that accidents have no cause, we assume that they will happen again. The real issue is that whether planned or unplanned, intended or unintended, preventable or non-preventable, someone or something is still injured or damaged. The result is still the same. No amount of name calling or sweet talk is going to change that fact. At the end of the day, we still have a mess to clean up. The unfortunate part is now we have separated our messes into two categories (something big data would not do). This wreaks all kinds of havoc on figuring out how to solve problems, prevent accidents and keep people safe. We need to face the music and deal with the nastiness that is accidents and the consequences. That is the only true way to prevent accidents or incidents from happening. Believe it or not, there is only one reason the term incident never became common place. OSHA. Yes, OSHA. Still to this day OSHA (Cal-OSHA) requires you to report accidents (http://www.dir.ca.gov/dosh/report-accident-or-injury.html). Not incidents, but accidents. And if you can’t get them to buy into the terminology change, then you can’t expect to get employees on all levels to buy in either. Therein lies the death of the war, the countless resources wasted changing forms and written policies, the countless meetings of the minds, phone calls and other conversations.